When I visited New Mexico recently, we rented the most fabulous place that had a view of Pedernal and Lake Abiquiu. Actually, it was 360-degrees of beautiful. It was such fun to race out of bed to capture the sunrise over the Lake each morning. But I digress. On the way to the rental property, there are pull-outs with scenic views of the Lake, and, I've been wanting to try my hand at making a pano, so I fired off seven photos of the Lake from the pull-out vantage point. My hope was to stitch them together - someday. Well, someday has arrived my friends. 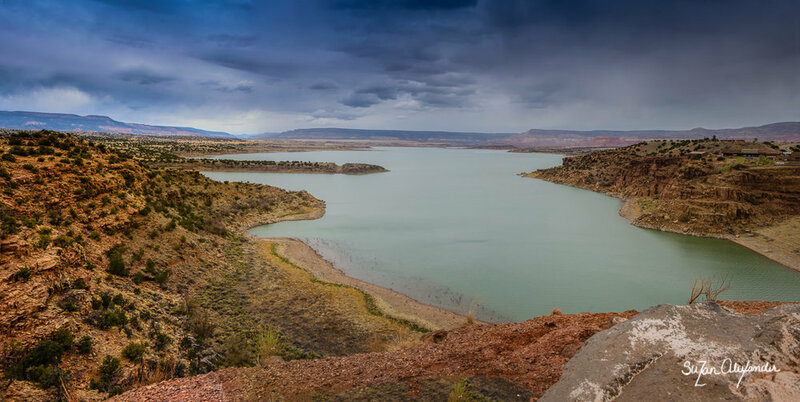 Allow me introduce you to Lake Abiquiu on a rainy day.